Home > Blog > Ask the Doctor: Does This Need Stitches? There’s never a convenient time to get a nasty cut. But when one happens, parents, caregivers and employers have to weigh the disruption to their busy lives with a trip to urgent care to get the cut tended. Whether it’s a cut from your kitchen knife or an injury from a fall, wounds have a limited window of time before it’s too late for suturing to help. Dr. Dan Phillips, owner of MedAccess, sat down with Megan Royer to help folks make that call. Megan Royer: What are some of the most common causes of cuts that require stitches? Dr. Dan Phillips: Well, it’s twofold. The most common causes are falls, like if someone falls down and strikes their head on something. And the other cause is a sharp object, like a kitchen utensil, if a knife slips. There are lots of other causes too – getting hit in the face, athletic injuries and nasty wounds from chainsaws. MR: What are some things to look for to determine if you should go in and get stitches? DP: If there’s any question, you should get checked. We really can’t close wounds after a certain period of time. You should get checked within 12 and 24 hours for head and neck wounds and about six hours for arm, leg or trunk wounds. Generally, the older the wound is, the higher the chance of infection. If the wound is bleeding and it won’t stop, you probably need stitches. If you can see fatty tissue, that’s a yellowish, globbing tissue, you probably need stitches. But if there’s a question, I’d recommend letting a medical professional look at it. Many times if you delay for days or hours, it’s too late. MR: What are some instances where it’s safe to say you don’t need stitches? DP: That depends on the level of medical knowledge or experience of the person. If you fall down and have some road rash, that doesn’t need to be sutured. I’ve had cuts I can BandAid together and get the bleeding to stop, but again, it all depends on the medical knowledge of the patient. Also, if it’s got a lot of dirt in it, you should be seen by a professional and get it cleaned out to reduce the chances of infection. MR: Are there any advantages to getting stitches rather than letting a wound heal on its own? DP: Yes. In many, many cases you can improve the scar effect by getting stitches. There’s going to be a scar from any cut, but getting a wound closed and done well reduces the scar formation. 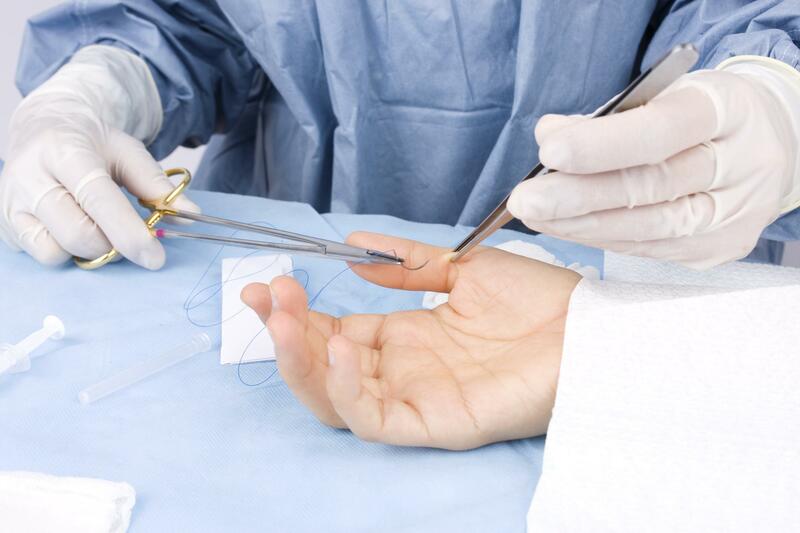 Getting stitches also reduces the chances of infection when it’s cleaned out and closed. It will also get the wounded area back to normal function sooner. Say there’s a cut on a finger where it bends — every time you bend your finger it pops open, so it’s better to get the wound closed and back to normal. MR: What is the average time that stitches need to stay in? DP: It depends on the part of the body and a number of other factors. For wounds on the face and scalp, stitches usually stay in for four to seven days. Wounds on the trunk (torso) or extremities stay in for 10 days. Stitches for wounds over a knee or elbow that are constantly bending stay in a little longer — as long as two weeks. You also have to consider other illnesses: people with kidney problems or diabetes heal slower so their stitches stay in longer. MR: Are there any alternatives to stitches? DP: There are several ways to close wounds. Besides sutures, we use a medical glue called Dermabond, which has limited uses but doesn’t cause tension on the skin. It is used a lot on kids. Another alternative is surgical staples. Sometimes you can use a butterfly or BandAid to close a wound if it stops bleeding quickly and there’s no tension. Sutures are the most common way to close a wound and they are made from nylon or a synthetic material, varying in size depending on the part of the body. MR: What are some safety precautions that may reduce your likelihood of getting a cut that will need stitches? DP: Use common sense. When using razor blades and knives, keep your hands out of the way and cut away from you. Take fall precautions. Particularly as people get older, above 60 or 65, they are not as steady and tend to fall easier. Just take common-sense precautions. MR: Anything else you think would be important for people to know about getting stitches? DP: When in doubt, get checked. It’s a lot easier to get checked and not need them then have long-term complications like a nasty infection. Avoid the long wait at the ER by visiting a MedAccess Urgent Care location in Chapel Hill, Roxboro or Youngsville next time you need to get a cut examined. Walk in or skip the wait altogether by checking in online. Make sure you know when it’s necessary to call 911.